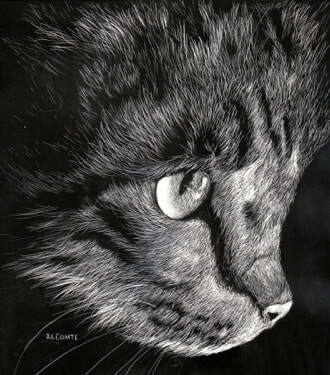 In this workshop, students will learn what scratchboard is, and be introduced to the basic elements and techniques. Each student will be given a board, a few accessories, and a detailed lesson with which they will be able to produce a lovely image and have a good basis upon which to build a competency in this medium.. This is not a "learn-to-draw" workshop, and it is suggested that students have some knowledge and/or experience drawing in another medium. minored in English at Douglass College (of Rutgers University) and graduated with a B.A. also written two novels and a collection of short works.